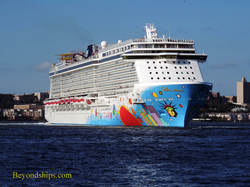 In April 2013, Norwegian Cruise Line took delivery of Norwegian Breakaway, an innovative ship both in its features and in the cruise experience it presents. Since then, the ship has crossed the Atlantic and completed a season of week-long cruises from New York to Bermuda. We sat down with Hotel Director Hugo Vanosmael to talk about how Breakaway has done in her first six months. The word innovative has a positive ring to it. However, in order to be innovative, you have to take some risk because implicit in the word is the idea that what you are doing is a departure from what has been done traditionally. Since Breakaway is innovative in her accommodations, entertainment and dining, the cruise line accepted some risk in building such a ship. However, that risk appears at this point to have been well-taken. Perhaps the most visible innovation on Breakaway is the Waterfront, which is an open-air promenade that has restaurants and bars opening out onto it. When the ship entered service some critics were skeptical about whether this feature could be used when the ship was at sea. Some additional thought on people flow was needed, however, due to the unexpected popularity of the ship's Atrium as an entertainment venue. The Atrium extends through Decks 6 and 7. 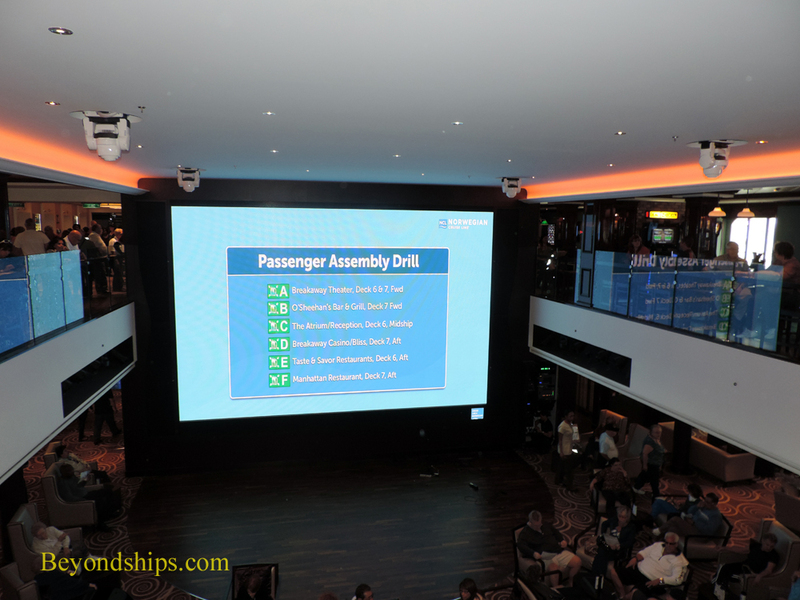 On Deck 6, there is a stage, a large screen and a collection of comfortable chairs. You can also watch from the public space on Deck 7. 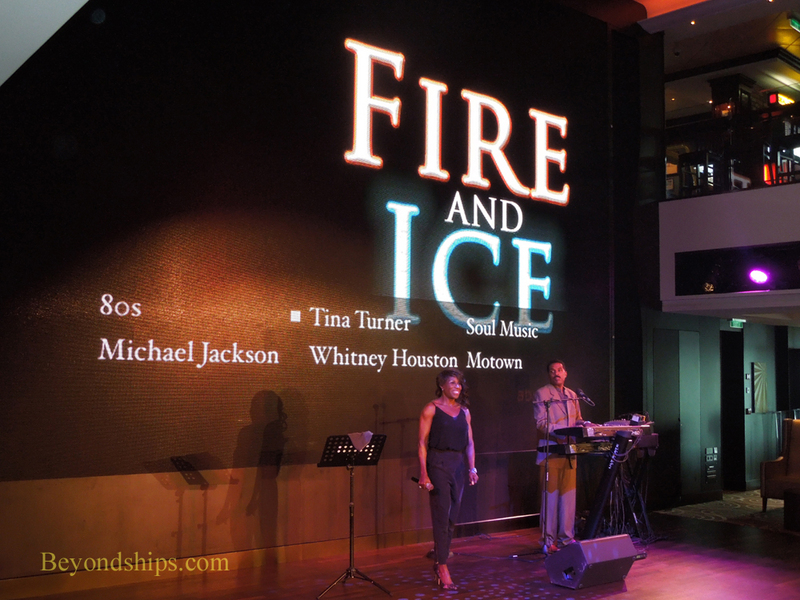 Above: Fire and Ice performing in the Atrium. Below: The Atrium from Deck 7. Another bold decision was to base Breakaway in New York year-round rather than in one of the Florida cruise capitals. New York is a difficult market, which several cruise lines have tried and failed to penetrate in the last decade. Moreover, Breakaway is the largest cruise ship to be based in New York to date. Another new feature on Breakaway designed with the New York market in mind is the Ocean Blue specialty restaurant. Created for Norwegian by well-known chef Geoffrey Zackarian, Ocean Blue is an upscale New York-style seafood restaurant (see our review). The fact that the cover charge for this venue is higher than most seagoing specialty restaurants has not deterred customers.